Some years ago I was approached to find a way to install an aftermarket brake booster with a dual reservoir master cylinder in a Squarebird. I was also asked to design a bracket system to mount an under dash booster on the cars with air conditioning. These both needed a redesigned bracket system. Up until a week ago, I had just put this off as too big of a project for the time I had. I am now getting ready to have set of brackets water jetted and bent up to try out for fit and functionality. I have already got a set of brackets, an aftermarket booster and also a dual master ready to mount up on a non air car and all fits well. One question I have is whether to go with a 1″ bore or a 1 1/8″ bore on the master cylinder. If any of you have input on this please let me know your opinions by an email to. jdrax@tbirdranch.com . please go check out the things I have listed. I have lots of stuff on there right now and I need to sell some of these things so I have more room here to drag more out and get it listed as well. I have so much stuff crammed on shelves upstairs and basically hidden from sight and you know…… out of sight, out of mind…… so true with this. This summer I will be sorting through a lot of the larger stuff I have and will probably list some of those things here on my blog. 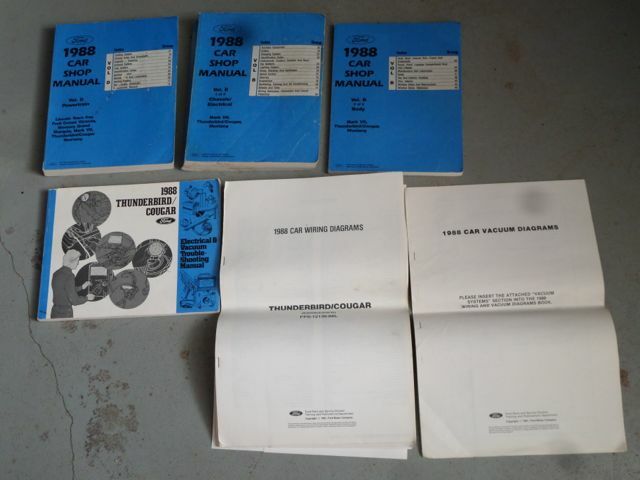 I just got in a couple of the 88 Thunderbird Electrical and Vacuum Troubleshooting Manuals. These are very rare already and they are invaluable if you have one of these cars. Everything electrical and vacuum is covered with diagrams and locations in this manual. If you want one of these contact me quick. I have 2 of them for sale. I also have a complete set of the electrical schematics and one set of 3 shop manuals. The shop manual set consists of Body, Chassis & Electrical, and Powertrain. What I have listed here is pretty much everything available for the 87, 88 bird. One note here……… the 87 and 88 are basically identical cars so if you cannot find manuals for one year you can use the other.